Viva il Papa! Habemus Papam. 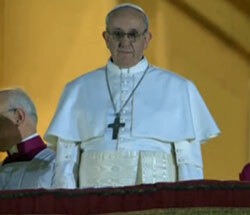 And his name is Pope Francis and he’s the 266th Pope. He was Cardinal Jorge Mario Bergoglio from Argentina. So he’s got a lot of firsts. He’s the first Pope born outside of Europe and first Pope born in the Americas. He’s also the first Pope Francis. How about that? I can’t tell you how happy a day this is. My Confirmation saint is Saint Francis of Assisi!